You’re 20 years old and 24 hours away from unarguably the biggest game in the history of college football. You’ve been out with an injury, but your rehab went well, you’ve put in pad time and shaken off some rust. You aren’t a backup or a third stringer. You are the #1 WR on the #1 offense in the country. Your team has struggled with injuries but still managed to string together dominant wins. In a heartbeat you watch as not just one, but two of your teams’ top offensive targets go down, one with injury and one found ineligible. What do you do? It’s not as if there isn’t precedent for this type of situation. The 2013/2014 NFL Champion Seattle Seahawks had an offensive weapon that hardly played leading up to Super Bowl XLVIII. Percy Harvin, the speedster who joined Seattle via trade with the Minnesota Vikings, came out and returned a kickoff for a TD that essentially iced the game for the ‘Hawks. But it wasn’t just his play when he had the ball in his hands. Almost as important was the fact that the Denver Bronco defense had to account for him, regardless of what his role was, and there was very little film to prepare with. Addison doesn’t necessarily have to touch the ball – the simple fact that the Ohio State defense will have to keep track of him, without knowing what he will do, may be enough to impact the game in Oregon’s direction. This isn’t a situation where Addison would be sacrificing the rest of his Oregon career for one game. 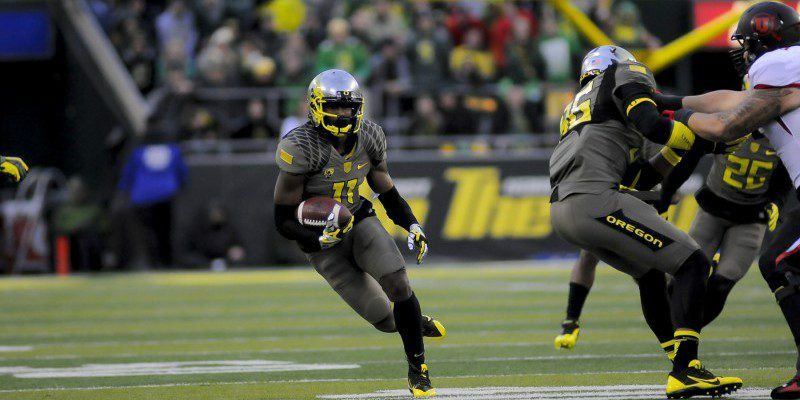 He would still have a year of eligibility if Oregon chose to burn his redshirt and allowed him to play in the NCG. Walter Camp Football, a leading online NFL Mock Draft website, has three wide receivers going in the first round and none of them are names like Kelvin Benjamin or Amari Cooper. It isn’t outside the realm of possibility that Addison could choose to leave early for the draft, especially if he has a big fall in 2015 for the Oregon Ducks. Right now he could go somewhere in the middle rounds. A huge game in the CFP NCG could boost his stock, get him some press for the 2015 season and launch him into earlier rounds. If Addison is healthy and wants to play, then let him play. Ohio State won’t know what to do with him and even if he only touches the ball a couple of times, this is the opportunity of a lifetime that any competitive athlete wouldn’t want to pass up. If your best offensive weapon is healthy, hungry and begging to play, then it should be a no-brainer. Put him in and watch him burn the Ohio State secondary.